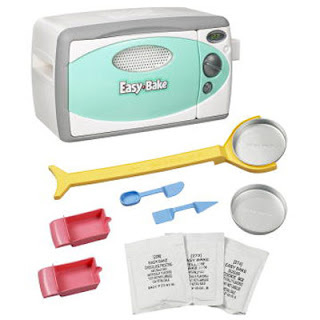 I have fond memories of making cake and cookies with my Easy Bake Oven when I was younger. It was bright yellow and resembled my moms oven(pictured right, top left). My cousin and I would make and eat cakes until our tummies hurt. 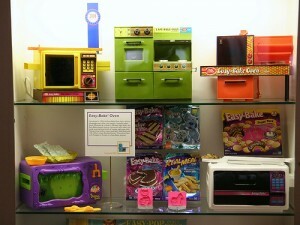 Over the past 40 years there have been 11 Easy-Bake Oven models. Since 1963, each revision reflected the colors and oven styles of their day. For Spring, Hasbro was introduced the Easy-Bake Oven and Snack Center for your little baker who likes to bake and eat snacks. My son was really excited when our oven arrived. Even though he doesn’t eat sweets (his choice), he really wanted to make cake for my husband and I. To get started all I needed to do was loosen 4 screws and screw in a 100 watt light bulb. After we heated it up(15 minutes) we were ready to go. Making goodies in the Easy-Bake Oven is really easy. The just add water directions were a nice way for me to introduce baking to him in a fun, no-stress manner. Our oven arrived with a yellow cake mix, 1 chocolate frosting mix and a sugar cookie mix, which we went through quickly. Because my son enjoyed baking with the oven so much, I purchased the brownie and Blueberry Muffin Tops Mixes. After a long day at work, daddy really appreciated coming home to fresh made brownies, which basically took us just minutes to bake. Even though the oven was designed for kids 8 and up, younger kids will love making their favorite snacks if fully assisted by mom or dad. For us, the Easy-Bake oven is a great way for my son to start to learn what mommy does in the kitchen every day. It also gives him a chance to understand how food is made.